Copyright: © 2018 Rahim B, et al. This is an open-access article distributed under the terms of the creative commons attribution license, which permits unrestricted use, distribution and reproduction in any medium, provided the original author and source are credited. Introduction: Hospital readmission leads to increased care cost and decreased quality of patients’ life. This study aimed to determine the role of continuous care model (CCM) on hospital readmission among patients with heart failure (HF) in North West of Iran. Methods: This randomized controlled clinical trial was performed on 60 HF patients admitted to Urmia University hospitals, Urmia, Iran in 2014. Participants were randomly allocated into two groups of intervention and control (30 patients in each) using randomization software. While the control group received routine hospital care, CCM was run in the intervention group during 3 months. Data were collected by questionnaire (demographic information, checklist related to readmission and questions to evaluate the treatment continuity and patients' care after hospital discharge). 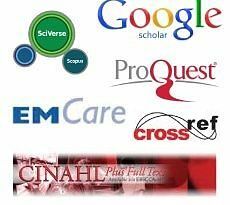 Readmission rates were measured and compared using descriptive and analytical statistics with SPSS version 19. Results: The mean readmission rate in both groups was approximately equal to 1.5 within three months prior to the intervention. After the intervention, the average number of readmissions greatly decreased in the intervention group from 1.53 times to 0.46, while in the control group, it increased from 1.46 to 1.76 with a significant difference between two groups (p=0.001). Conclusion: Our results confirmed that the application of CCM could significantly reduce the readmission rates in HF patients and thus lead to decrease care cost and increase the quality of life in patients' with HF. Heart failure (HF) has been recognized to be one of the most significant concerns about the health of the community and a major issue for research related to cardiovascular diseases . It is one of the major causes of hospitalization and increased cost of treatment . It is reported that hospitalization due to heart failure is around 1%-2% of total healthcare . In addition, the highest rates of preventable readmissions are among patients with HF . It has been estimated that around 24% of patients with HF are readmitted within 30 days of hospitalization . The patient readmission within a short time to hospital discharge is costly [6,7] and also an important criterion for assessing the quality of care in a health system . So, attention to strategies for reducing hospital readmission has an essential role in improving health care quality and lowering health care costs [6-8]. It should be noted that the lowest rate of readmission can be viewed with continuous caring interventions and self- care training . Several studies have shown that the leading causes of readmission include: Lack of awareness among patients, early discharge, poor patient compliance of proper medicational and nutritional diet, age, male gender, chronic disability, living alone, the inevitable recurrence of disease, inadequate medical care, poor hygiene, inadequate rehabilitation and weak planning during discharge [9,10]. Adequate knowledge of patients and their families as well as the ability for self-care among patients with HF are known as key contributors to reduce hospital readmissions. Self-care behaviors are required to self-manage disease through continuous care, changing lifestyle, increasing follow-up and ongoing education of patients and their families by a health care team, especially the nurses . In a clinical trial study; the Continuous Care Model (CCM (that included four phases of orientation, sensitization, monitoring, and evaluation was planned to reduce readmission of coronary patients . In this model, patients were introduced as an active and potent agent in their health care. The CCM has been defined as a regular and ongoing method in which an impressionable relation between the patients and nurses has a major role in finding out patients' needs and problems, sensitizing patients to comply unremitting healthy behaviors in order to maintain and improve their health . Essential functions of CCM include: The knowledge about the disease and its nature, identifying the potential problems about the disease, the acceptance of disease as a long life condition, the role of continuous self-control, proper health behaviors, awareness of the value of being healthy, family participation to achieve a healthier life, changes in lifestyle patterns and improving self-esteem, recognizing the healthcare team and how to work with them. The properties of these local models can be cited as a constant and efficient care that is fully coordinated to the characteristics of chronic disease such as HF . Due to the high readmission rates and negative socioeconomic impact of this disease, it is necessary to utilize appropriate model which is compatible with the condition of these patients in order to prevent readmissions and also to improve health care quality and reduce health care costs. Therefore, this study was carried out to determine the effects of continuous care on readmission of patients with congestive HF admitted to the selected hospitals of Urmia University of Medical Sciences. It should be mentioned that the study was conducted over a period of 3 months in 2013. Random allocation method was used in this randomized controlled clinical trial study in order to create homogeneous research conditions for the intervention and control groups. The sample population consisted of 60 congestive patients with HF who were hospitalized in university-affiliated hospitals, Taleghani and Seyed Al-Shohada hospitals, in 2013 in West Azerbaijan, Urmia, Iran. The sample size was calculated based on a randomized clinical trial study about the effect of continuous home visits on the readmission rates among discharged patients with HF . According to this study, the mean (μ) and standard deviation (SD) in the control group were 2.74 (μ1) and 1.07 (SD1), respectively. While in the intervention group, the aforementioned figures were 1.65 (μ2) and 1.01 (SD2), respectively, with the confidence value 95% (Z=1.96) and 80% power with a p value of less than 0.05. Based on the following formula*, 28 patients were calculated for each group in our study for reaffirmation, 60 patients with HF were totally considered as sample size in this study and participants were randomly assigned into two groups: control group (n=30) and the intervention group (n=30). For this purpose, participants were assigned by means of a random allocation computer program using the list of their names in the randomization software. *n=(1.96+0.84)2 ˟ (1.07+1.01)2 / (2.74-1.65)2=28. • Easy access and control within three months. • The presence of pacemaker or implantable cardioverter defibrillators. The data gathering tool was a questionnaire divided into three parts, the first part contained demographic and behavioral risk factors that was filled out by the patient nurse at the start of getting acquainted with the patient and her/his risk factors. This part consisted of demographic information and an assessment of the patient risk factors, clinical history, frequency of hospitalization, blood indices, body mass index (BMI), diet, smoking, and the medications. The second part was a self-reporting checklist of patient that was designed in order to encourage the creation and continuation of treatment compliance and self-care procedures. The third part was a checklist of readmission that was completed by patients at the end of the study. The scientific validity of the questionnaire was investigated based on the literature and comments of 7 cardiologists. To determine the reliability of the instrument the test-retest method was used. In this matter, 30 patients have completed the questionnaire and based on their feedbacks the questionnaire was redesigned. Finally, a correlation coefficient of 0.91 and Cronbach's alpha 0.81 approved the reliability of the questionnaire. The orientation phase: The first session was held to familiarize, justify, and encourage the patient and his/her family to understand and actively engage in the follow-up process. Another objective of this phase was to evaluate the causes and the consequences of readmission. The meeting lasted about 30 to 40 minutes in a proper place in the hospital. At this point, the investigator, the patient and his/her family met and expressed their expectations and emphasized the need for care. The nurse was introduced to the patient and the family. Demographic data was obtained. Information about the following issues was given to the patient and their families: behavioral risk factors, medications being used, their dosage and usage, diet, patient's vital signs, transparency of the patient and the family expectations. Later, the informed consent forms were completed. The time of meeting and the manner of communication was planned. The meeting was held for both the intervention and the control groups; however, the content in terms of time, kind of the expectations and the plans for future was different. The sensitization phase: The next meeting of the CCM was held to sensitize and to involve the patient and his/her family in the care and follow-up process. In this meeting, all aspects of educational needs related to self-care were assessed under the guidance of an educational supervisor at the hospital. Each session lasted 90-120 minutes. The content of this part of the program was based on the latest articles, books and consultations with the faculty experts. The objective of this phase of the instruction was to familiarize the patient and his/her family about the disease, the properties of HF, compliance with medical team, taking the medication promptly, following relevant restriction strategies, limiting food salt intake, controlling fluid intake, the importance of daily weighting procedures, the importance of permissible physical activity and how to do it, proper life style, the importance of smoking cessation and avoiding drugs and alcohol, the importance of vaccination, the need to reduce the stress and the ways to overcome stress, controlling blood pressure and the need for glycemic control in diabetic patients. Also, some instructions were presented by the researchers about HF symptoms, for example shortness of breath, edema in the legs, feet, and ankles, chest pain, persistent cough, development of insomnia, and increased need for sleep pillows to ease the breathing. These interventions were carried out in the hospital during patients’ hospitalization and were completed after hospital discharge at home. At the end of this session a training package including self-care booklets were given to the patients and their families. Moreover, a self-reporting checklist was designed in order to encourage the patients for their self-care and adherence to treatment continuity planning which included 6 guidelines (adherence to medication, diet restrictions on the use of the salt and fluid intake, daily activity, sport, avoiding tobacco and alcohol use, and daily weighting). The patients were trained to fill in the checklist, personally. At the end of each week for full compliance +3, for moderate adherences +2 and for low adherence +1 was marked on the checklist. On the day of discharge, the summary of the given instructions and the questionnaire filling methods were reviewed. After discharge, the researchers continuously encouraged the patients by phone to follow orders and to complete the checklist each week for 3 months. In addition to the self-report checklist that was given to the patients, there were similar checklists for the researchers. At the end of each week researchers assessed the rate of the patients’ adherence to the guidelines and then completed the checklist about the patient compliance. In compliance with the above guidelines, the positive aspects of patients’ treatment were encouraged such as improvement in the disease symptoms. In case of non-compliance with the guidelines, the necessary training was presented to the patients and their families. Furthermore, serious complications of non-compliance such as worsening of the disease conditions and the repeated admissions to the hospital were noted. Finally, the researchers observed whether the patient has followed his/her status or not. The control phase: It should be noted that, the most appropriate programs without the continued use and management finally lose their optimum effect. So the objective of this stage was to maintain the interaction, investigate and the process of care and evaluate the attention to new problems regarding self-care, consider the period of the disease and the feedback of the previous meetings, instruct the patients during inadequate self-care phase, consider and control the symptoms such as weight gain, shortness of breath, swelling of extremities, loss of appetite, insomnia development and recommend them to consult the doctors immediately as well as following the checklist completion. Continuous follow-up of the patients after discharge was based on patients’ needs regarding the instructional and self-care requirements. This phase of the study was completed by telephone and, if necessary a personal visit at home was scheduled. The first call lasted 30 minutes on average but it differed depending on the needs of the patients. Also, to motivate the patients to continue compliance of the treatment regimens, the research team sent a message to the patients once a week to remind the completion of the self-care checklist. This follow-up continued for 3 months. At the end of the third month, the readmission checklist was completed by the patients of both the intervention and the control groups while self-reported checklist was collected in the intervention group. Evaluation phase: It was the final step in the CCM, but due to its importance, it was a major concern during all phases of our study. The objective of this phase was to evaluate the effect of continuous care on the patient compliance and the rate of re-admissions. The measures in this step included assessing patients’ compliance in the intervention group based on 6 guidelines including: daily weighting, low-salt diet, considering the prescribed diet, daily physical activity, avoidance from tobacco and alcohol and restrictions on the use of fluid intake. Also, in this phase readmissions in both intervention and control groups were evaluated by assessing readmission checklists and related questionnaires. Data were analyzed using descriptive (mean, standard deviation, frequency) and analytical statistics (chi-square and independent t-test) by SPSS software (version19) (Figure 1). Ethical considerations: The protocol of this investigation was approved by the Ethics Committee of Urmia University of Medical Sciences (code No: ir.umsu.rec.1392.49). Written consents forms were obtained from all participants after explaining the study protocol and the objectives of the study. The participation in the study was voluntary. The study population included 60 patients with HF. They were divided into intervention and control groups, with 30 patients in each group. Table 1 demonstrates demographic characteristics of patients with HF admitted to the study. The mean age in both groups was approximately 65 years (65.03 ± 9.47 in the intervention group and 64.83 ± 9.72 in the control group). The mean BMI of the patients in the intervention group was 26.50 ± 3.68 and it was 26.66 ± 3.68 in the control group. Most subjects of both groups were married (73.3% in the intervention group and 80% in the control group, respectively). In the intervention group, 83.3% of the families and 86.7% of the families control group, had university degrees. A large number of patients were property owners (76.6% in the intervention group and 83.3% in the control group). In the intervention group 18 patients (60.0%) and in the control group 19 patients (63.3%) had easy access to hospital. Thirty five patients (58.33%) were in NYHA class III of HF. The average length of hospital stay for both groups was about 6 days. No significant difference was observed in the demographic variables before the intervention in both groups (Table 1). Table 1 Demographic prevalence of heart failure patients admitted to hospitals, Urmia, 2013. Evaluation of the patient self-report checklist have shown that most of the patients in the intervention group had compliance with 6 recommended guidelines (considering prescribed medical diet, low salt diet, proper physical activity, daily weighting, avoiding smoking and limiting the fluid intake) (Table 2). The mean number of readmission in the both groups has been approximately equal to 1.5 in the three months prior to intervention and no significant differences was observed between the two groups based on the results of the independent t-test (p=0.83) (Table 3). In the following three months of the intervention, the average number of readmissions in the intervention group was 0.46±0.68 while it was 1.761 ± .25 within the control group (Table 4). Therefore, following the application of CCM, the patients’ hospital readmission rates within intervention group were significantly lower than the control group. Based on the results of the independent t-test the difference between the two groups was totally significant (p=0.001). In other words, the application of CCM considerably differentiates the patients’ rehospitalization in both groups at the end of 1st, 2nd and 3rd months of the intervention (Table 5). Table 2 Compliance rates of patients in the intervention group. Table 3 Readmission rates of patients in the both groups in the last 3 months before intervention. t:Independent t-test, p-value is considered significant if<0.05. Table 4 Readmission rates of patients in the both groups after 3 months intervention. Table 5 Distribution of hospital readmission in both groups at the end of 1st, 2nd and 3rd month of intervention. The results of the present study showed that before applying CCM, there were no statistically significant differences regarding readmission between patients in the intervention and the control groups. This similarity could be due to the homogeneity of the groups in terms of demographic variables. But after 3 months of intervention, results demonstrated significant differences between two groups on reducing hospital readmission rates in the intervention group. Moreover, at the end of 1st, 2nd and 3rd months of the intervention, there is considerable reduction in the rates of hospital readmission. A study about training during discharge in patients with HF demonstrated that 54% of readmissions could be prevented through training during discharge. Also, it showed that insufficient training and lack of patients follow-up was an important causative factor for re-hospitalization . These findings are in line with our study that confirms CCM reduces hospital readmission. Results of Caldwell’s study indicated that training enhanced patients’ knowledge and self-care behaviors, since prior to the intervention, no significant differences were observed between the two groups in care behaviors. However, following the training, self-care behaviors in the intervention group was significantly better than the control group . The clinical trial of Naylor with the implementation of a discharge plan  and also the effect of the disease management program on hospital readmission of patients with HF through educating patients and their families by telephone patient follow-up by McDonald [12,18-20] during a period of three months showed that the rates of readmission in the intervention group were significantly lower than the control group. All these findings are in agreement with the results of our study declaring that CCM following HF patients’ discharge influence and reduce the rates of readmission by adequate training of patients and their families and create self-care ability. The core finding of our research was also confirmed by other researches [17-21] that the reduction of hospital readmission rates among HF patients necessitates the involvement of nurses to provide patient education and their evaluation in home setting subsequent to hospital discharge. The evaluation of readmissions is a process in which increases the quality of care while reduces care costs [6-8]. Inadequate education of the patients and the families and lack of a self-care management are important risk factors in rehospitalization of patients with HF. The application of continuous care programs during and after discharge with experienced nurses is vital in order to increase the awareness and promote self-care behaviors to control symptoms and prevent complications of the disease and ultimately increase the quality of life. In addition, applying CCM can decrease readmission of HF patients and save expenses related to the lack of control in such debilitating disease. This project was a part of the nursing master’s thesis submitted by “Alireza Mashalahi” (grant No. 1292) and was funded by Urmia University of Medical Sciences. Thanks to University Vice Chancellor of Research and Technology and authorities that helped us conduct this project. The authors also thank all patients who helped in this research and colleagues of Taleghani and Seyed Al-Shohada hospitals. Okunji PO, Daniel J (2014) Degenerative neurological comorbidities in patients hospitalized with congestive heart failure. Circ Cardiovasc Qual Outcomes 7: A221. Susan E, Quaglietti J, Atwood E, Ackerman L, Froelicher V (2000) Management of the patient with congestive heart failure using outpatient, home, and palliative care. Progress Cardiovas Dis 43: 259-274. Fatima U, Ali F, Prasad H, Stapleton D (2012) Influence of hemoglobin and uric acid level on Re admissions for Heart Failure. World J Cardiol 26: 23-30. National Priorities Partnership (2010) Compact action brief: A roadmap for increasing value in health care; preventing hospital readmissions: A $25 billion opportunity. Desai AS, Stevenson LW (2012) Rehospitalization for Heart Frailer, Predict or Prevent? Circ Cardiovasc Qual Outcomes 126: 501-506. Hubbard T, McNeill N (2012) Improving medication adherence and reducing readmission: A NEHI Issue Brief. Adib-Hajbaghery M, Maghaminejad F, Abbasi A (2013) The role of continuous care in reducing readmission for patients with heart failure. J Caring Sci 2: 255-267. Lakdizaji S, Hassankhni H, Mohajje AA, Khajegodary M, Salehi R (2013) Effect of educational program on quality of life of patients with heart failure: a randomized clinical trial. J Caring Sci 2: 11-18. Martens KH, Mellor SD (1997) A study of the relationship between home care services and hospital readmission of patients with congestive heart failure. Home Health Nurse 15: 123-129. Wexler DJ, Chen J, Smith GL, Radford MJ, Yaari SW, et al. (2001) Predictors of costs of caring for elderly patients discharged with heart failure. Am Heart J 142: 350-357. Vavouranakis I, Lambrogiannakis E, Markakis G, Dermitzakis A, Haroniti Z, et al. (2003) Effect of home-based intervention on hospital readmission and quality of life in middle-aged patients with severe congestive heart failure: a 12-month follow up study. Eur J Cardiovasc Nurs 2: 105-111. 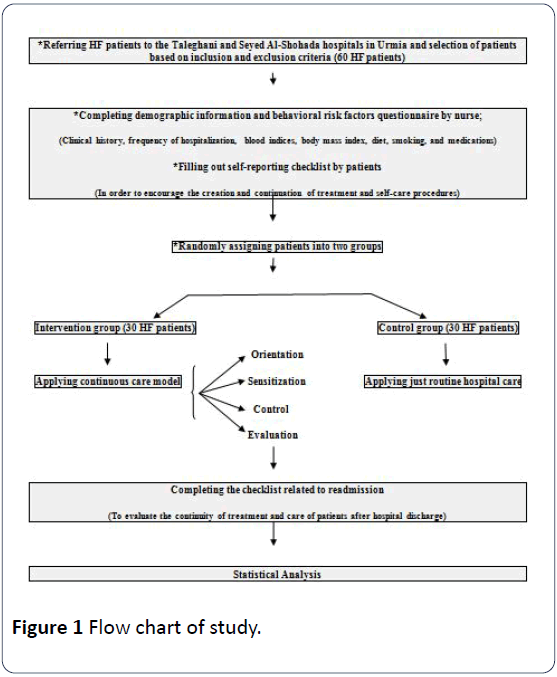 Ahmadi F, Ghofranipour F, Abedi H, Arefi S, Faghih-zadeh S (2005) The effect of continuous consultation care model on rehospitalization and chest pain in patients with coronary artery disease. J Qazvin University Med Sci 9: 99-103. Ghavami H, Ahmadi F, Entezami H, Meamarian R (2006) The effect of continuous care model on diabetic patients’ blood pressure. J Med Educ 2: 87-97. Salehitali SH, Dehkordi HA, Hosseini SM, Jafari A (2009) The effect of continuous home visits and health education on the rate or readmissions, referrals and health care costs among discharged patients with heart failure. Journal of Faculty of Nursing and Midwifery, Tehran University of Medical Science 15: 43-49. Paul S (2008) Hospital discharge education for patients with heart failure: what really works and what is the evidence? Critical Care Nurse 28: 66-82. Caldwell MA, Peters KJ, Dracup KA (2005) A simplified education program improves knowledge, self-care behavior, and disease severity in heart failure patients in rural settings. Am Heart J 150: 983. Naylor MD, Brooten DA, Campbell RL, Maislin G, McCauley KM, et al. (2004) Transitional care of older adults hospitalized with heart failure: a randomized controlled trial. J Am Geriatr Soc 52: 675-684. McDonald K, Ledwidge M, Cahill J, Quigley P, Maurer B, et al. (2002) Heart failure management: multidisciplinary care has intrinsic benefit above the optimizations of optimization of medical care. J Card Fail 8: 142-148. Riegel B, Carlson B, Kopp Z, LePetri B, Glaser D, et al. (2002) Effect of a standardized nursecase-management telephone intervention on resource use in patients with chronic heart failure. Arch Intern Med 162: 705-712. Ahmadi F, Ghofranipour F, Abedi AH, Arefi SH, Faqihzadeh S (2005) Effect of ongoing care counseling on re-admission and chest pain in patients with coronary artery disease. J Qazvin University Med Sci 9: 99-103. Shojaee A, Nehrir B, Naderi N, Zareyan (2013) A assessment of the effect of education and telephon follow up by nurse on readmission of patient with heart failure. Iran J Critical Care Nursing 6: 29-38.